Here’s an Introduction. To cut to the chase, the theme here is exploring the mystical side of Bible reading. In other words, it’s about exploring your full potential in life. For more on how the process can be like either a Super Mario Brothers game – or an ongoing “transcendental meditation” – see The Gist. Every martial art – judo, kendo, aikido, etc. – has its own forms, actions, procedure. Beginners must learn the kata and assimilate and use them. Later, they begin to create out of them, in the way specific to each art. Unfortunately, it’s much easier to focus on the corporate or “business” side of the local church. But each church should also have its mystical side. The problem? It’s much easier to focus on the corporate side. (Rather than put in the persistent, ongoing work to achieve a “divine union.”) So working on the corporate side is necessary, but tends to “kill the spirit.” Thus it’s only the mystical or spiritual side of Christianity that can help you on your spiritual journey. So the theme here is that the Bible was written to liberate us. Another point: Imagine – just for a moment – that people just like us wrote the Bible. Imagine that it was written a long long time ago, by people who had all the faults and failings that we have today. Yet somehow, those people found a personal union with God, the Force that Created the Universe. Finding your union with God is what this blog is all about. It’s kind of like “copying masterpieces.” To become a better artist, you first imitate the Old Masters. But from that you then start developing your own unique style. So how will this blog help you – the reader – find that Union With God? Let’s turn to the metaphor that to you, the Bible is a “vast unexplored continent.” If you’re planning a trek into that vast continent, you’ll want a guide who’s already been there. That’s where I come in. I started my first journey through the Bible 23 years ago, on July 14, 1992. Since then I’ve gone through it eleven full times. (I started the 12th journey last November 30.) In that process I’ve read through the Psalms and Gospels 36 to 44 times each. Here’s the normal format for these blog-posts: 1) a lead image, usually an old-timey painting, preferably by the likes of Rembrandt or El Greco; 2) the main text; 3) a bottom image, followed by; 4) notes and references, in Italics. Re: self-defense. 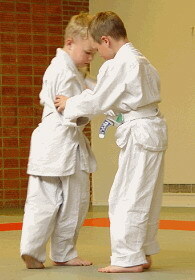 The image is courtesy of Judo – Wikipedia. See also Right of self-defense – Wikipedia. The parachute image is courtesy of Parachuting. Re: “ways and means.” An allusion to the House of Representatives’ Ways and Means committee, and others like it. The term refers to a government body “charged with reviewing and making recommendations for government budgets,” with the main goal being “to forward the objectives of economic policy.” See Wikipedia, the free encyclopedia. Since January of 2009 the ownership and management of Discovering Lewis & Clark® has been in the hands of the Lewis and Clark Fort Mandan Foundation … to make this the most comprehensive and useful Lewis and Clark website on the Internet.